Simple, elegant and classic! 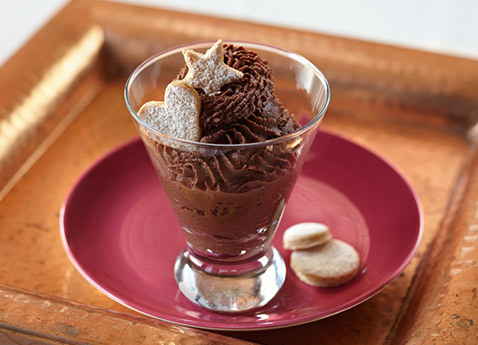 Mousse au chocolat is the quintessential French dessert. When you travel to France, no matter where you eat in any region, you will most likely be offered this divine “foamy chocolate” (mousse means “foam” in French). Rich, creamy, dark and dreamy, chocolate mousse is not only a perfect gourmet treat, it is also one of the simplest to make. The exact date or year that chocolate mousse debuted in France is unknown, but its popularity has certainly soared over the years—we even have an official National Chocolate Mousse Day in the US. Remember to celebrate your chocolate! Place egg yolks and sugar in a medium bowl and whisk to combine. Place 1 C of the cream in a small, heavy saucepan over medium heat until bubbles just begin to show around edges. Slowly pour cream into yolk mixture, whisking until completely combined. Return mixture to saucepan and cook over low heat, stirring constantly, until mixture registers 160°F on a candy thermometer. Remove from heat and pour through a fine-mesh strainer into a large bowl. Stir in vanilla. Place chocolate in a large microwave-safe bowl and heat on high at 30-second intervals until melted. Stir until chocolate is smooth. Spoon yolk mixture into chocolate, whisking until smooth. Place remaining cream in a large bowl and beat with an electric mixer until stiff peaks form. Spoon a cup of the cream into chocolate mixture and stir to combine. Add remaining cream, folding it in gently with a rubber spatula just to combine. Spoon or pipe into dessert glasses and chill for at least 2 hours or up to overnight. Garnish with a bit of chopped chocolate and serve cold.